Last week I posted about the fortified churches in Transylvania, eight of which make up a UNESCO World Heritage Site. 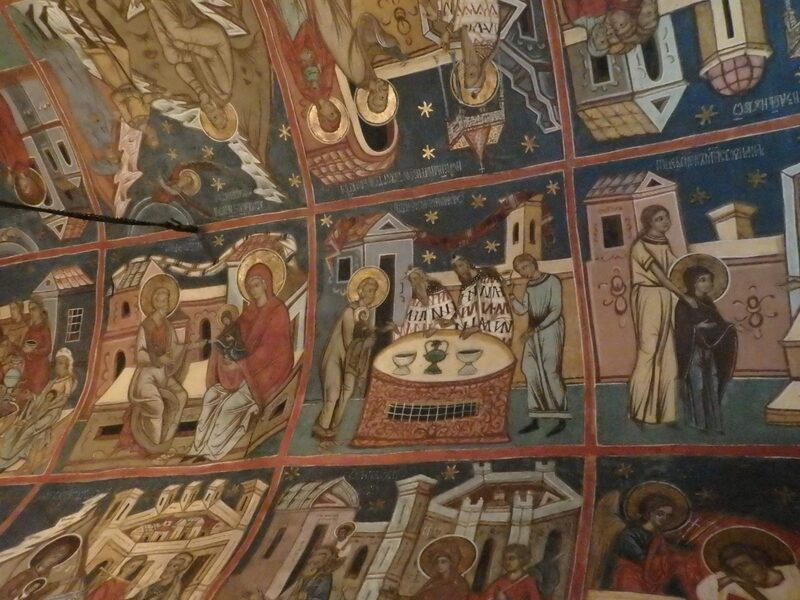 A richly painted fresco inside Moldoviţa, one of the painted churches of Moldavia. The images cover the churches entirely, outside and inside. On the exterior, the frescoes start just above the ground and reach right to the roof line. Inside, every inch of the walls and ceilings is covered as well. The church at Voronet Monastery. Images of saints and Bible stories cover its walls completely. The paintings are in the Byzantine style, with the typical poses and often awkward postures of much medieval art. Figures standing behind others do not appear in correct perspective, or a crowd is represented by a row of people, with just a series of heads behind them. Yet the detail is often impressive, even emotional, and decorative detail fills the spaces between the panels as well. Over the centuries, some of the paintings have faded, but the colors that remain still astounded us. While in some cases one side of the building has faded to a more or less uniform blur, the other sides are still vibrant. I assume this is due to better protection from wind and weather. Only minimal conservation work has been done on the paintings, while the roofs have been replaced. That means that the frescoes inside are even more vivid than outside. 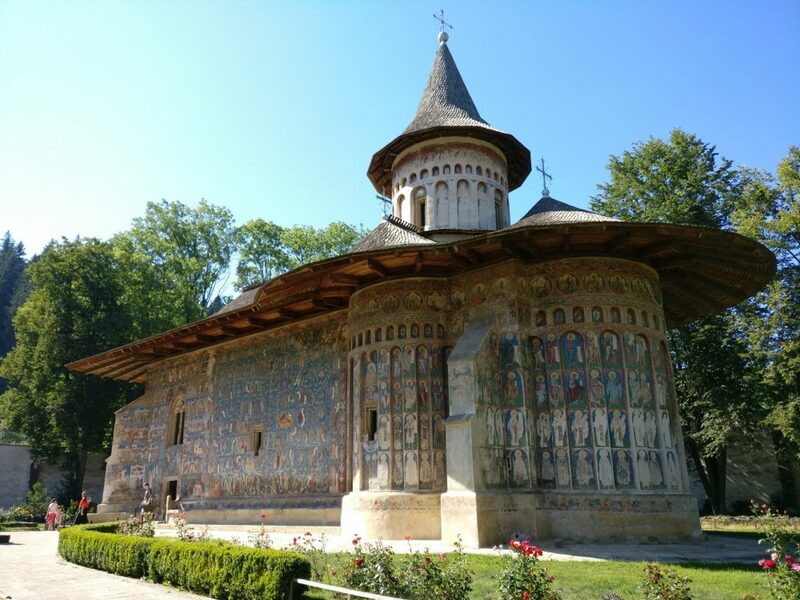 Of the eight painted churches of Moldavia listed by UNESCO, we visited six: Arbore, Humor, Moldaviţa, Pătrăuţi, Sucevita and Voronet. Humor monastery was founded in the 14th century, but its church was destroyed in the early 15th century. The Great Chancellor Toader Bubaiog rebuilt it and dedicated it to the Assumption of the Holy Virgin. 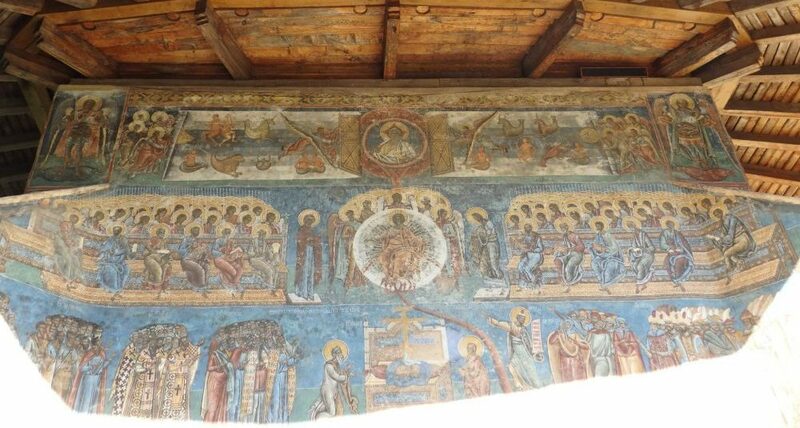 It’s quite a small one, and the paintings were added in 1535, done by Toma of Suceava. Interestingly, one of the sides of the exterior portrays a non-biblical event: the Siege of Constantinople. Built in 1532, this monastery’s church has paintings commissioned by Petru Rareş in 1537. Rareş was the illegitimate son of Stephen the Great, King of Moldavia, and became king himself after him. Like the ones at Humor, Toma of Suceava was the painter. Again, besides the usual processions of saints and Bible stories, this church includes a depiction of the Siege of Constantinople in 628 AD. According to the Romania Tourism website, the siege painting is inspired by a poem thanking the Virgin Mary for helping save the city of Constantinople from an attack by the Persians. Given that at the time the church was built, Moldavia was under threat from the Ottomans, it’s not surprising that the siege shows the enemy as Turks (wearing turbans) rather than as Persians. I particularly liked these odd figures — angels? — on the vertical panel between the inset processions of saints. Petru Rareş’s daughter got into the church-building business around 1581 with the Church of the Resurrection here at Suceviţa Monastery. Two Romanians called Ion and Sofronie painted it in 1596. 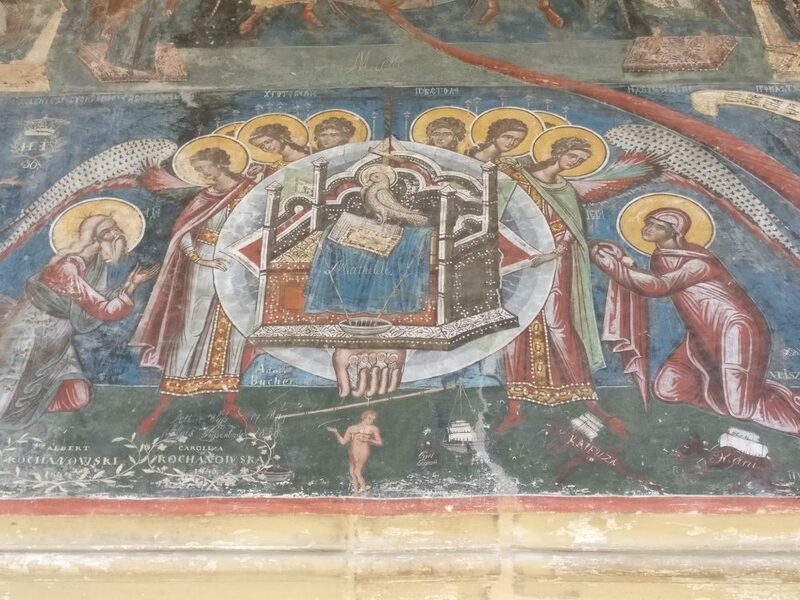 However, the western wall has no frescoes; according to the Tourism Romania website again, the story goes that the work stopped when one of the painters fell from the scaffolding and died. 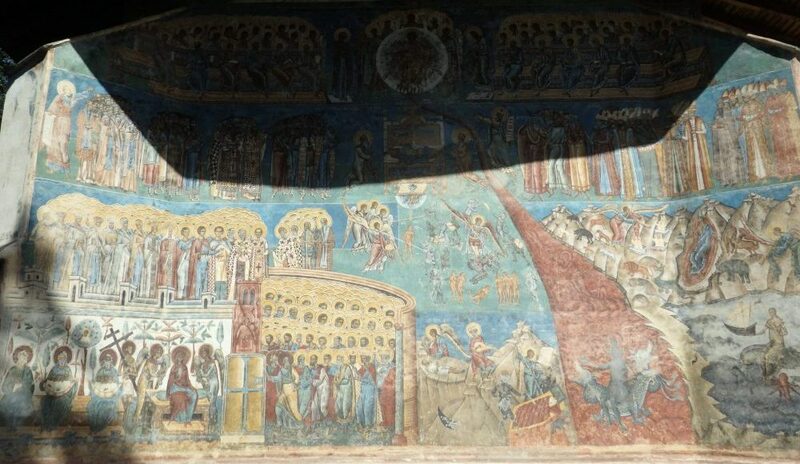 On this exterior wall, on the left, you can see a depiction of the Last Judgement: the winged and haloed watchers above, and the general chaos below. 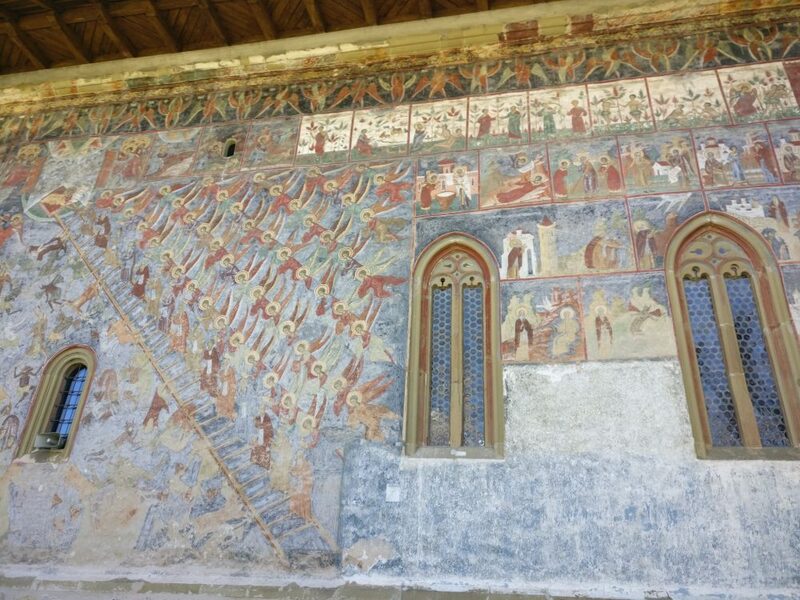 The angels climb a diagonal ladder, which is inscribed, according to the Romania Tourism website, with monastic virtues on each rung. Notice that the devils are portrayed as black. Hmm. At the top, in the white panels, you can make out what I think is the Garden of Eden story. The church at Voroneţ monastery is dedicated to Saint George the Martyr, and dates to 1488. Stephen the Great founded it after a victory in battle against the Turks. On the west side of the building is an enormous image of the Last Judgment. I particularly enjoyed looking at representations of the Last Judgment: all devils and torture and nastiness, with saints looking on from the safety of heaven. The top half of an entire wall dedicated to the Last Judgment. The bottom half was in full sunlight, so I couldn’t get a picture of the whole thing in one shot. Not the best photo, but here’s the bottom half of the wall, showing the river of fire, naked tortured souls, and a multitude of saints. Called The Church of the Beheading of Saint John the Baptist, Arbore dates to 1502, with paintings from 1541. A local nobleman called Luca Arbore ordered the work. His niece commissioned the paintings from an artist called Dragosin and a group of painters working for him. 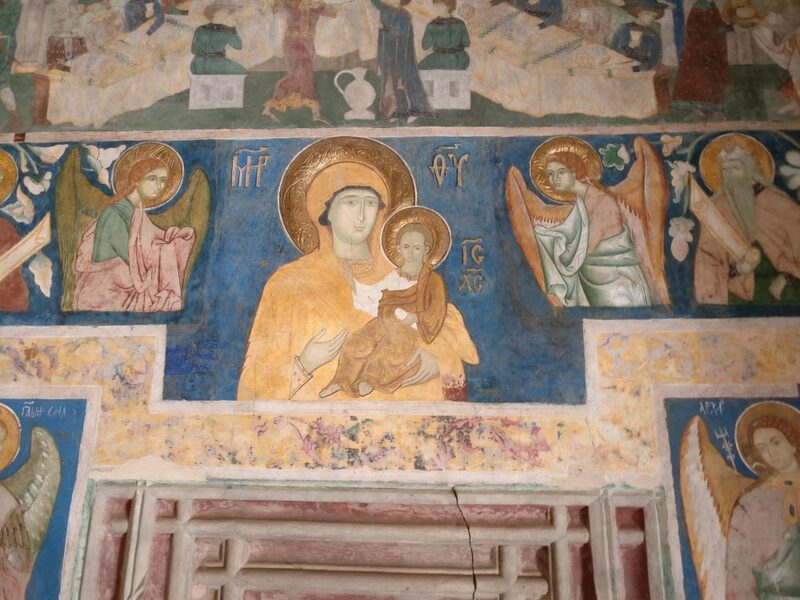 A Madonna and Child image inside the church at Arbore. Stephen the Great founded the church of the Holy Cross in Pătrăuţi as a convent in 1487. 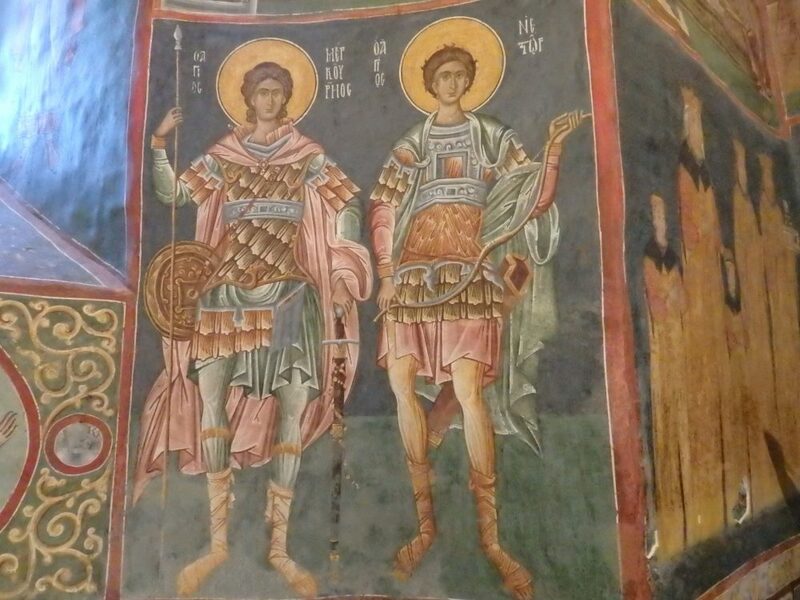 It’s unclear who painted the frescoes inside: the sign at the church just says he was a Greek and that the paintings date to the time of Stephen the Great. In any case, I think they are the most accomplished of any of the churches we saw. A panel from inside Patrauti church. Look at the detail the painter put into it! Do you happen to know who they are? The outside is unusual in that some of the exterior decorations are not frescoes but rather ceramic plates, and only part of the outside holds artwork. The outside work was probably done in the 15th or 16th century. 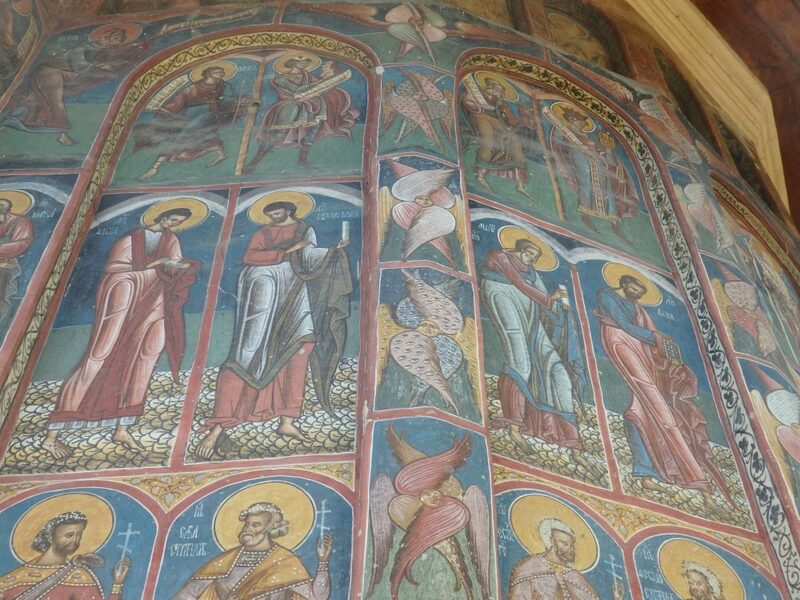 We did not see the other two churches in the UNESCO collection, the one at Probota or the one at Suceava. If you are reading this and you have seen them, I’d love to hear from you! 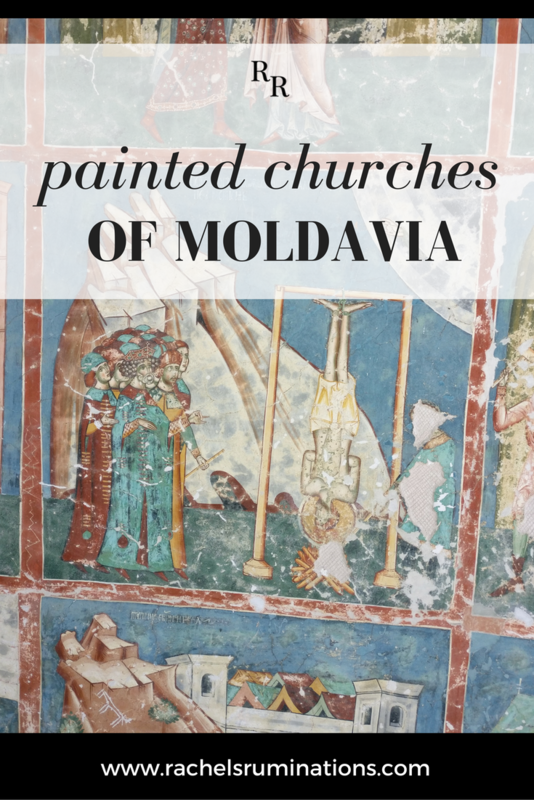 Details: All of the painted churches of Moldavia are within an hour of Suceava, so if you want to see them all, you could stay there, or anywhere in Bucovina. Open every day, 9-6:30. Inside some of them, you may not take pictures. If you have to pay an entrance fee, it will be the equivalent of a euro or two. There may also be a fee for photography. These look amazing. I’m pretty sure I need to get here.